This is another post that I have been a little slow to get to. 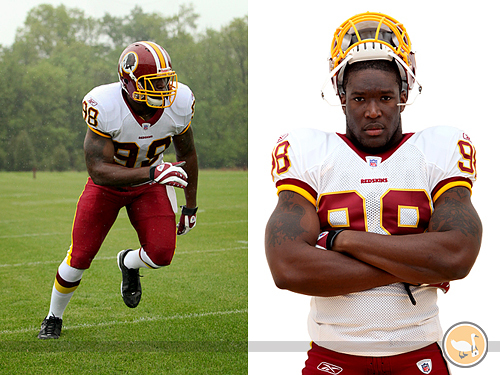 But back in May I had the opportunity to shoot a couple of portraits for the Washington Redskins. They told me that they wanted a portrait for among other things to go on one of the game tickets for season ticket holders. First of all we headed into the racquetball court and shot a couple of standard portraits and then we headed outside into the rain and shot some of Brian running some drills. The outside shot I believe is the shot that will make it onto the game tickets and the shot with the white background was one of my favourites. I am really hoping that I get a copy of one of the tickets! I will post it if I ever do.